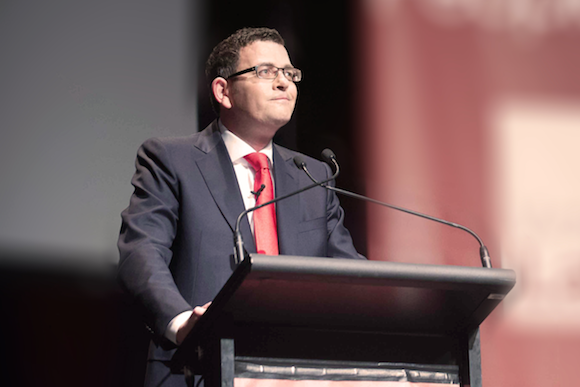 Daniel Andrews has been swept to power with a swing of 2.6 per cent to Labor across the state. Mr Andrews relegated the Liberal/National coalition to the pages of history as the first one-term government in Victoria in 60 years. It also turned out to be a historic night for the Greens, who won their first ever lower house seats. Greens candidate for Melbourne Ellen Sandell claimed victory over Labor's Jennifer Kanis on Saturday night, but Ms Kanis only conceded defeat on the Tuesday. After an incredibly close contest in Prahran, the Greens' Sam Hibbins took the seat from the Liberals Clem Newton-Brown by just 277 votes. And in Shepparton country voters sent a message to the Nationals, electing Independent candidate Suzanna Sheed in a seat the Nationals had held for 47 years. Labor won 47 seats to the Liberals' 30 seats, while the Nationals took eight seats (losing party status as a result), the Greens two and one independent. Election night played out much like the polls had predicted. They had shown a certain Labor win for the entire campaign. Voters sent a message to the Coalition at the polling booths, with swings against the parties across the state. In his victory speech Mr Andrews said Victorians had voted for a government that puts people first. He said work would begin on Sunday on a raft of Labor election promises saying: "I will not accept four more years like the last four and neither will the people". Mr Andrews promised to end the ambos dispute, increase funding for TAFE, support the state's emergency services workers and fight unemployment. "Victorians have today voted for better local roads and public transport," he said. "Victorians have today voted to get Victoria back to work." He praised Liberal leader Denis Napthine and thanked him for his service to Victoria and described the victory as "the greatest of gifts". Conceding defeat, Dr Napthine said he was proud of the work his government had done, putting PSOs in train stations, signing up to the National Disability Insurance Scheme and Gonski, and delivering a budget surplus. "I have conceded that he has won this election and we congratulate Mr Andrews in that victory," Dr Napthine said. He said the Coalition had left Victoria "in a better state". Dr Napthine also thanked former premier Ted Baillieu for his work in winning 2010 poll. He said he would be stepping down as leader of the Liberal party.